Does anyone else remember those Kiosks in the mall, during the 90's, where you could have your name written on a grain of rice. They would then put it in a bottle and make it into a necklace. Well, I still happen to have mine! Here is a picture of the actual grain of rice necklace I wore as a teen. 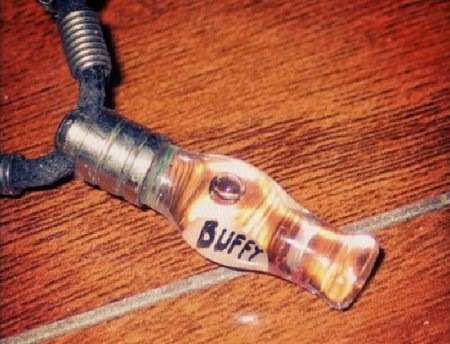 Since I was a HUGE Buffy nerd, it only seemed fitting that I would have my favorite BTVS character's name put on it. It was also the pin name I went by, when writing class notes to friends. 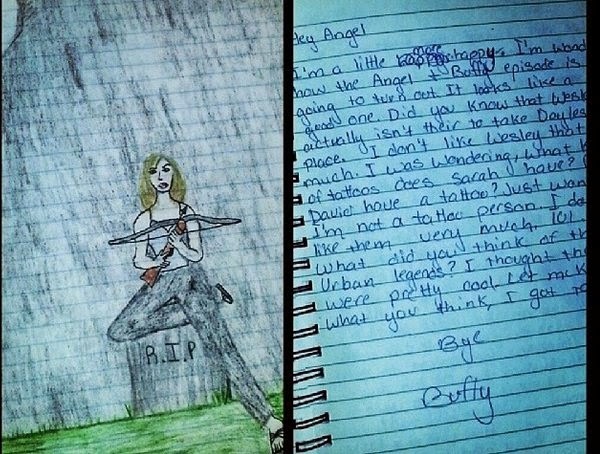 We all used names from Btvs. It's strange to know, that one day we will explain to our kids, "When I was your age, we used to put our names on grains of rice and make it into a necklace and that was fashionable". Here's a look back at what a gigantic dork I was in high school. It's my spiral I used to write notes to friends while in class. We thought we were sooo sneaky by not signing our notes with our real names, despite the fact that I for some reason had name written on the back of the spiral. This note is dated Jan. 12, 2000. Like most people, I wasn't a big fan of Wesley, at the time, due to his fuddy-duddy like nature in Buffy season 3. But overtime he grew on me and now I of course adore him.